When it comes to today's post, I had taken a little bit of time to put my points together, simply because I will be touching on a product sold via MLM. And when it comes to MLM, it gets a little tricky because I do not want to sound like an agent and I also realised that many people find searching for agents a hassle. Well, I can assure you I am not an agent and as for the latter, this brand has many online agents available with almost hassle-free transactions. 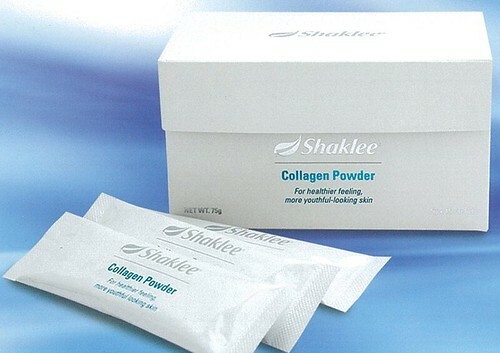 So today, I shall inform you on the very famous Collagen Powder by Shaklee. Recently, I noticed a growing trend of women consuming collagen drinks readily available at many drugstores. I was intrigued by the promotions everywhere and testimonials of people who have been consuming them. I did some research of my own and found a handful of brands that I am interested to try, placing priority on the brand name (reputable or not), price and the many benefits shared by consumers in online forums. Even asked a few bloggers on their experiences for the different brands they are promoting. I've heard a lot of good things - how collagen is said to improve skintone and hair structure, and gives a boost of energy to busy women. 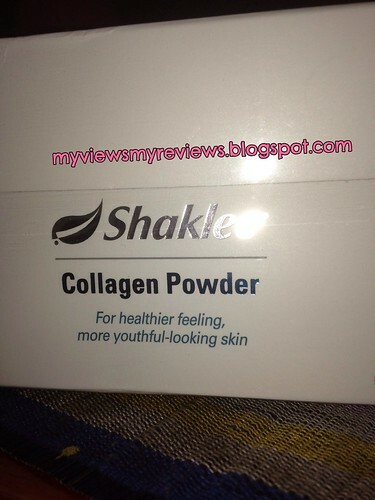 Though I was ready to make a purchase on one certain brand, it was so apt that my friend, Puteri, gave this Shaklee Collagen Powder pack to me, for an independent review. First of all, let me tell you that this must be one of the most expensive in the market. It only has 15 sticks, that if you consume it every day, one box only lasts you for a 1/2 month. However, if you're one that prioritise the highest quality of ingredients, you might want to take a second look at this product. After all, if you're ingesting something, you might as well know A-Z what you're putting into your body and the manufacturer who produces them must have a long history of trustworthiness. As much as it makes your skin moist and glowy, a lot of people would tell me that a small percentage of consumers are allergic to collagen. Since it is made up of marine life, those who are allergic to seafood would probably have some side effects from drinking this. The Shaklee Collagen Powder is made up of collagen from the scales of the red snapper. Apparently, this made it one of the most expensive, but a better quality one too. Its really fine molecules make this powdered content really easy to be mixed with water and the presence of lactobacillus acidofilus so synonymous with its function to ease your digestive system, makes it even better for your tummy. There are also many other beneficial ingredients including Vitamin C and B to help make the collagen work better for you. Overall, it is supposed to maintain healthier skin, with claims such as reducing/eliminating wrinkles, tightening of your skin, reducing your pores and I've been told that some women could also see their skin looking brighter. Collagen is supposed to make you look youthful and so, it claims to moisturise your skin from the inside out and make you feel less tired throughout the day. So now, let me tell you what I think of it. I got a little creative on my first use and mixed the powder with Dermalogica's Hydrating Mist. Nothing great from there and didn't feel anything dramatic. Was disappointed, even. Didn't give up and at the 2nd usage, I realised that it may actually be just perfect when mixed with a little water, which I did. And it felt amazing. My skin felt instantly tighter upon application of the mask. After I rinsed it off 10 minutes later, I could see a softer complexion and pores less noticeable. Of course, I had scrubbed my face first before applying the mask. When I woke up the next morning, my skin felt dewy moist and it didn't look tired at all. And that's only after one use! My only main grouse is - it smells fishy. Like you know, fish scale fishy. Yucky and ewe. But since I am hooked on the results, every time I would slather this on my skin as a mask, I would just frown as I anticipate the odour making its way to my nostrils. Drinking it is no mean feat either. The smell just totally pushed me away. To make it taste and smell better, I made sure to mix the powder in apple juice and had once mixed it up with a yoghurt drink. Didn't really like it as a drink, that I can tell you. Bearable with additional flavoured water but not an enjoyable experience. I only drank 3 sticks of it and thankfully, after that 3rd day, I found that I am probably seeing some reactions to the drink. Hence, I decided to just stick to using it as a mask. I think if you're hell bent on quality products, I can tell you that this one is probably it. It is one of a best-selling products in its category. But then again, I haven't used any other collagen products and so I cannot give any apple to apple comparison. The price is pretty steep if you intend to drink it as one box is not enough for a month's supply but if you are thinking of using it as an effective face mask, the steep price as a drink is actually pretty much almost dirt cheap as a mask. I mean, if I can be all generous and make one stick last for 6 usage, 15 sticks in the box can last 90 times. If you use it twice a week, that'll last you 11 months! But, the question is - can you stand the fishy smell? - I tried another solution: To place a piece of My Beauty Diary's sheet mask on the collagen mask when it is almost dry and my senses all perk up quickly. If you need to find out more, please feel free to visit Puteri's blog, here where you can find her number and email address as well. She blogs mostly in BM but she is fluent in English and usually quite helpful with your enquiries. Are you using any collagen product? Which one is your favourite? a nice and comprehensive review. i myself did try collagen powder in fruit juice because i was so afraid that it would taste n smells like fish. but in honey dew juice is taste great. Try mix the collagen powder with mango juice. It effectively remove that fishy smell. Really enjoy reading your sincere review on Collagen Powder. At first, I also couldn't stand its smell. But, as what you did, I tried my best to tolerate with that smell, and now, luckily I can drink collagen on its own, without mixing it with any other drinks. I begin to get quite comfortable with its taste. Unbelievable. For the most part, because I get tremendous results Collagen Powder provides.